This one makes me shudder, too. 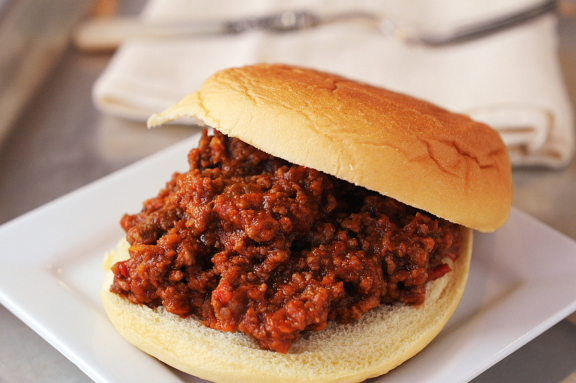 The incandescent orange of the Hunt’s Manwich sloppy joe sauce (came in a can, still does) mixed with high-fat hamburger on a limp insubstantial bun. The sweetness of that sauce, like ketchup on steroids, the dripping orange grease, gives me the creeps, then as now. The silver lining of this meal was it was likely to come with a side of tater tots, carefully parceled out according to whomever had the most need for carbohydrates (that would be my sister). (I enjoyed my few, especially the burnt ones.) Since an element of green was required, frozen or canned peas went along for the ride. 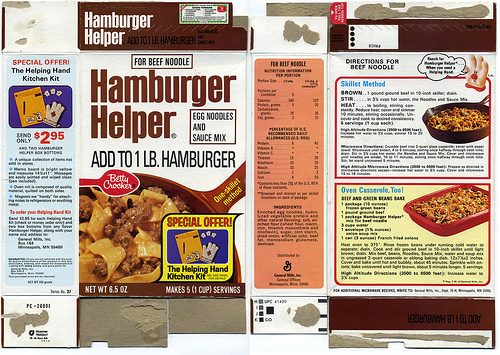 One bad and frequent meal was Hamburger Helper with some canned or frozen vegetable. I am amazed to find this still on the market. One of the original convenience foods of the 60s and 70s, it is fast and cheap if you have a coupon, especially, but with few other redeeming qualities (unless you’re out for a long list of unpronounceable chemical ingredients, vast empty calories and sky-high sodium counts). From the vantage point of today’s emphasis on fresh, in-season, ideally local produce and “whole,” less processed foods, Hamburger Helper is anathema. 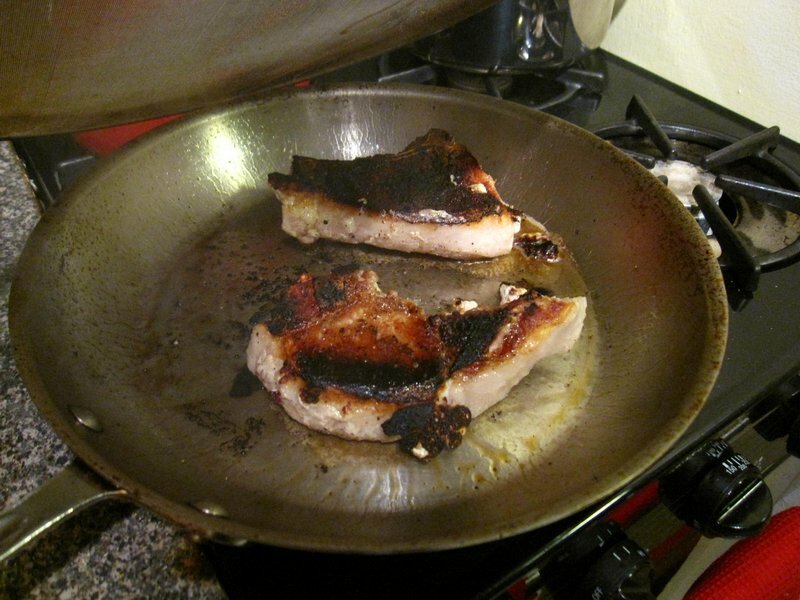 But people still buy it, testimony – to me – of the drudgery of the weeknight meal. HH reduces the need to choose and speeds things along nicely, getting mothers that much closer to that blissful quiet hour after the dishes are done and before bedtime rituals begin. While we’re at it, let’s call out some particularly miserable side dishes, shall we? My son was complaining just tonight that he did not like the taste of some prepared mashed potatoes that I bought with some pre-fab fried chicken at the grocery store. (Full disclosure: I make the best mashed potatoes in the world and I had no intention of eating the prepared ones — or the chicken for that matter — tonight.) Hey, I thought, at least they were identifiably potato-based. Could that be said about one staple of the SueG pantry: Instant mashed potatoes? A cursory Internet search has not turned up a picture of the box that we used. As I remember it, there was a picture of a giant potato and the box was red and white. At any rate, these mysterious flakes would show up, mixed with skim milk and topped off — you guessed it — with margarine, next to the baked chicken or perhaps the scorched pork chops. Unfortunately, before the days of the microwave, it was difficult to get these warm enough. And they had a curious texture that could turn treacherously liquid if just a bit too much milk was used. Instant mashed potatoes had the virtue of being instant. And people did not come roaring back for more, both good things to SG. On the other hand, they were without taste and …odd… in texture. Not good things, to me. these are all meals i loved as a kid… even now! So you like the vast unpronounceable chemicals, empty calories and sky-high sodium counts. It’s a free country!